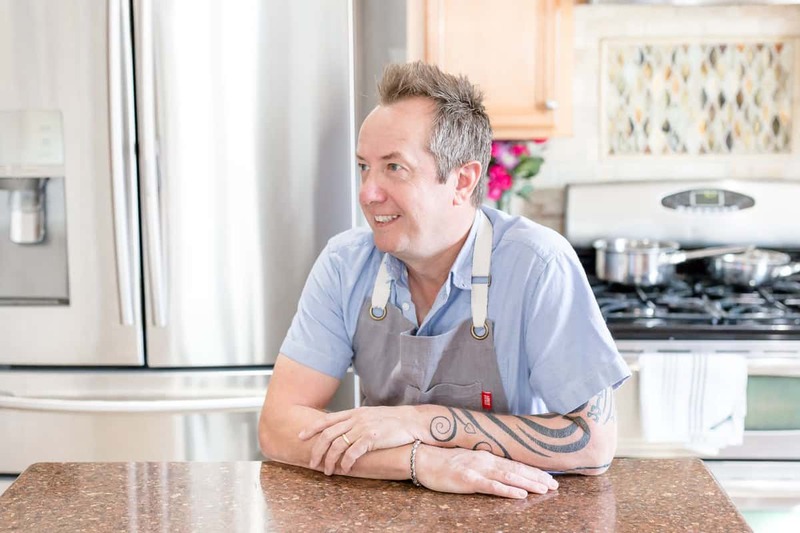 When I was contacted by Heather, the blogger presently known as Girlichef to take part in a cookbook cook off experiment I almost bought a plane ticket to head on over and mess up her kitchen. Back up she explained as this was a virtual cook off and proceeded to tell me how I would receive Lisa Fain’s shiny new cookbook, The Homesick Texan courtesy of those generous people from Hyperion, in the mail and to wait for further instruction on what recipes myself and eighteen other lucky blogger’s would have to make over a three week period and blog about. Well the book was delivered and I grabbed it from the nice lady who drives the white and purple truck and started to salivate at all of the great pictures and recipes that I wanted to make but I had to wait for instructions from my sensei! 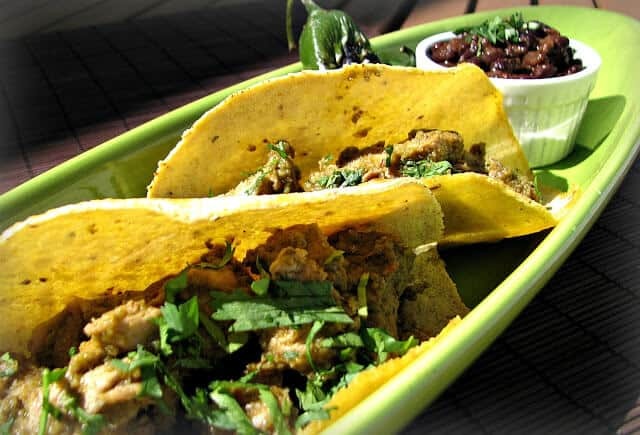 Finally we were given the go ahead to make the first dish, It was pork tacos in the style of those sold at the gas stations in Dallas and Austin-style black beans. Just in case anybody doesn’t know I live in Southern California and I could eat tacos from many different restaurants every day of the week if I wanted to. I have some favorites and was a little skeptical of how tacos from Texas might taste. They look great in the book and after reading through the recipe list my skepticism started to fade. These tacos have crept into my top three favorites list, wait they didn’t creep they strode right on up past all of the other tacos. The recipe requires the pork to be marinaded in a chile puree for 8 hours but I ended up being a little side tracked and instead of cutting that time and rushing to make them I decided to postpone and have them for dinner the next night so my pork marinaded for almost twenty four hours. In no way did this detract from the olympic gold winning taste and I was very happy when I sat down and devoured them alongside my side of black beans. I must admit I rarely, nay never make beans from scratch so I was excited at being prodded into making these Austin-style black beans. It was very easy with time being one of the most important ingredients when cooking the beans and a little help from my wife. Cooked very slowly with some great additional ingredients thrown in made me realise that it doesn’t always have to be re-fried and I have a great respect to all of the bean makers out there stirring quietly over the stove. A few hours later I stole a spoonful and loved the taste of the smoky and spicy flavors. This is an awesome book and like many of the other blogger’s taking part in this extravaganza I have bookmarked many other recipes which I am yearning to make. I can’t wait until our next cook off post so stay tuned. In a a dry skillet heated on high, toast the pasilla chile’s on each side for about 10 seconds until they puff. Fill the pan with enough water to cover them. Leave the heat on until it starts to boil and then turn off the heat and let them soak for about 30 minutes. While the chile’s are soaking rinse the pork and trim the fat. Cut into half-inch size pieces. Once the pasilla’s are hydrated drain and rinse them. Place them in a blender with the chipotle chili, garlic, oregano, cumin, cloves, orange juice, pineapple juice, vinegar and olive oil. Blend until smooth and add salt to taste. Toss the diced pork with the chile puree and place in a non-reactive container, and store in the fridge for 8 hours. Before cooking let the pork sit at room temp for 30 minutes. To cook the pork, heat the veg oil in a large skillet on medium. Fry the pork in the skillet for 15 minutes stirring occasionally. While the pork is cooking place the jalapenos under the broiler until blackened turning once. Serve pork in warm tortillas, topped with cilantro and onions, along with the roasted jalapeno,lime wedges and salsa on the side. Rinse and sort through the beans removing any stones or shrivelled ones. Place the beans in a large pot and cover with 1 inch of water. Bring to a boil and cook for 15 minutes. Return the empty pot to the stove and on med-low heat, warm the veg oil. Add the onions and carrots and occasionally stir. Cook until the onions are translucent and the carrots are lighter, about 8 minutes. Add the garlic and cook 30 more seconds. Return the beans to the pot along with the chipotle chile and 1/4 cup of cilantro. Cover with 2 inches of water, bring to a boil and then turn down the heat to low and simmer uncovered for 90 minutes. After 90 minutes add the remaining cilantro, cumin, tomato paste, and lime juice. Taste and add salt. Cook uncovered for another 30 minutes or until beans are tender.The ultimate cooking time will depend on the freshness of the beans. When done smash a few beans against the side of the pot with a spoon to thicken the broth. Stir and serve. « Kale Burger. The Secret Recipe Club…. Isn’t it great when you get a cookbook that you can’t wait to cook a load of recipes from. Sounds like this is one of those. I’m afraid I haven’t got your taco expertise but will take your recommendation and put this on my ‘gold standard’ list. Yum…yep, those look like Texas tacos for sure! I live in San Antonio, where there’s a taco stand on nearly every corner. But? Sometimes homemade is just best…this reminds me a bit of tacos el pastor with the yummy fruit juices. I think I need to get this cookbook and make a batch of these soon!! Oh man I want these now!! haha I may need to go get some taco’s for dinner! Top three, huh? That’s high praise! They look fabulous and I enjoyed your descriptions. What a fun challenge to be a part of! I would have loved it. Good job. It looks excellent! Congrats on a great job! 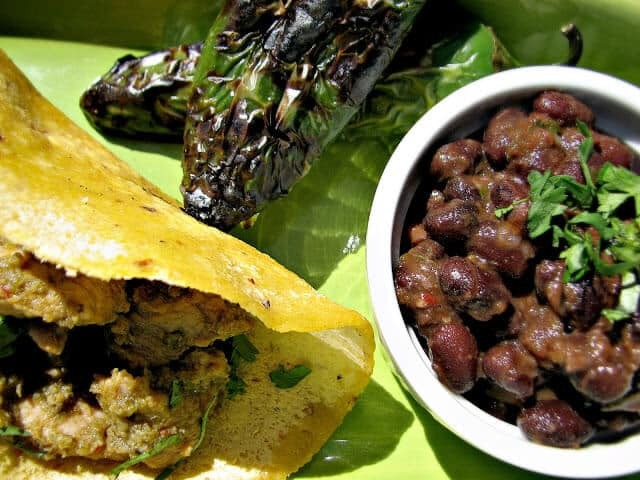 These beans and tacos look scrumptious! I am drooling and wishing that I had these for lunch. Great post! I love your blog setup. Yours looks great! The tacos were delicious…I bet the extra time marinating really put the flavor over the top. Everything sounds so good. I have made Cuban style black beans now I want to try Austin style…which is perfect for our family, my daughter is into black beans lately. The tacos are gorgeous! I wants some now! Yum! The tacos look so good! I’ve never made pork tacos before, but this looks like a must try. Thanks for sharing. Awesome – I love Heather’s blog! Great combo of flavors in the meat… the cloves, pineapple and orange look awesome. Great work, Gerry! Thanks everyone, Aimee I would love to post some Scottish dishes especially my all time favorite haggis! It’s always interesting to see how a different region prepares a dish. The tacos look delicious. Your cookoff sounds like so much fun! This dish looks amazing. Great pics! I also have a ton of recipes bookamrked, loving this book! weren’t those beans outrageous! i didn’t make the tacos…but after seeing everyone’s posts…i think i need too! looking forward to “cooking” some more with ya! Your presentation of the Taco’s and Beans is so pretty and a very nice post. The taco’s are delicious and my beans will be done in a little while and I can’t wait to taste them. It is fun cooking with you! You have a gift, those look & sound terrific! These sound delicious, I love that you added chipotle in adobo, I rarely use it but it sounds like a great addition! These look INSANE! I can’t wait to get that book. Great post – you’re such a great photographer & I think you should signe your daughter up for acting lessons! First I wanted to tell you that you have a beautiful blog here. I really enjoyed reading about the food trucks. Here in rural KY I could only dream about such things. LOL! I wondered what would happen if the pork marinated overnight and am glad to know that it all worked out great. It’s kinda hard to marinate something for 8 hours and hope to eat that same night for dinner. Anyway, I agree with you. I thought these tacos were top notch and I’d definitely make ’em again. Yours look great! It’s a good thing that we were given dishes to make – it would have been tough to choose! Your dishes look great. The tacos and beans were SO delicious! I live in Mexico, where we also have a couple of taco stands on every street corner, but it was nice to be able to recreate them in my own kitchen. Your photos are stunning and the bright sunshine makes me just a little homesick for SoCal. Hello fellow SoCal-ian. I agree with you on the tacos…we have great tacos here but Texas sure knows how to amp that up…bigger and better. Looking forward to cooking with your this month.